Several hundreds of thousands of people in South Yemen attended the festival celebrating the 53rd anniversary of the glorious October 14 revolution. October 14, 1963 is when people of South Arabia (South Yemen) launched a rebellion against the British occupation and by November 30, 1967 South Arabia was free of British rule. Southerners from all of the southern governorates attended the mass rally in the capital Aden. The rally was titled “Committed to Freedom and Independence” and despite the many threats, the celebrations went on without any problems. 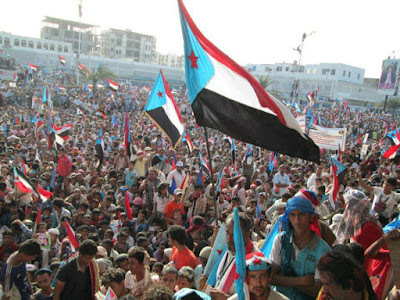 While the rally was to commemorate the October 14 Revolution, the masses on the square and the Southern Movement leaders who organized the event called for ending Yemen Unity, establishing a South Yemen political entity, and renewed their demands for a United Nations sponsored referendum.